It's not exactly "dinner" that I want to talk about. But I couldn't really put it all into a single word, so "dinner" is what you get. I was reading this essay about Shared Meals earlier today and I've been thinking about it ever since. While I don't always agree with everything on this site for Christian women, I can count on them to force me to think! 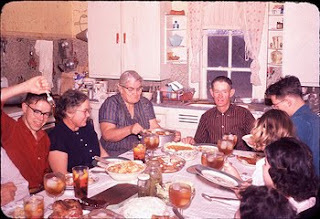 I remember well my own family dinner table. (I've shared this before). We always ate together. We always sat in the same place. I was down there at the end; my left-handed brother sat at the corner so his elbow wouldn't conflict with anyone else's space. Much conversation happened at our table. Many lessons were taught and learned--some obvious, some not-so-much. Much is written these days about ways our culture has changed. Many a comment has been made about the loss of the family dinner table. The essay I referenced earlier speaks of the changes in hospitality, the need for congregations to find ways to resurrect the shared meal, the importance of modeling Jesus' teachings about the common table. Congregational practices around "pot luck" that informal ninth sacrament always generate lively discussion. Small groups and new groups (think Barrie) --ask them how often the eat together! It's one of the best ways we know how to bond a community into something tight and real. Listen to the "experts" on family dynamics and the psychology of children or teens and pretty soon, you're likely to hear them talking about the need to establish, or re-establish the practice of eating together as a family. They'll advise you to turn off the television, remove the ear-buds and sit together at the table and to make it a habit. I am really quite aware that I haven't offered you much in the way of answers. I'm quite conscious of the barriers that exist--the time crunch, the sports and school schedules, the allure of fast and pre-prepared meals, the dearth of time and volunteers to manage the congregational communal meal. But what do you think? Have we lost something that we should be reviving? Have we managed to hold onto something we want to keep? Is there something theological here that we might need to think about more deeply? If you've got thoughts on this, please share. If you'd like to raise some more questions that's OK too. But if you've got answers toss them into the mix as well. I don't have any answers either, just an observation. My brother and I are 3 years apart in age. We had different friends, different interests, different activities. We didn't spend much time doing things together -- except clearing the table and washing the dishes every night, after our family ate dinner together. That was our "daily chore". Some years he washed and I dried, some years I washed and he dried, but we did it together most every night. I don't remember now what we talked about. I just remember that we talked to each other -- daily -- in a way that we would never have done otherwise.